All Nippon Airways and United Airlines are showing 2-in-1 flights that allow you to spend time in both Tokyo, Japan and Hong Kong for $653 to $699 CAD roundtrip including taxes. You would fly from Saskatoon to Tokyo, Japan (spend time there) and then fly from Tokyo to Hong Kong (spend time there), and then fly home from Hong Kong to Saskatoon. Most flights are with ANA on the way there, and United Airlines on the way home. The above are just example dates. You can try playing around with the middle date to give yourself more or less time in Tokyo vs Hong Kong. You can also try playing around with the start and end dates to make the overall trip shorter or longer. I would focus on Monday, Tuesday, Wednesday and Thursday dates. 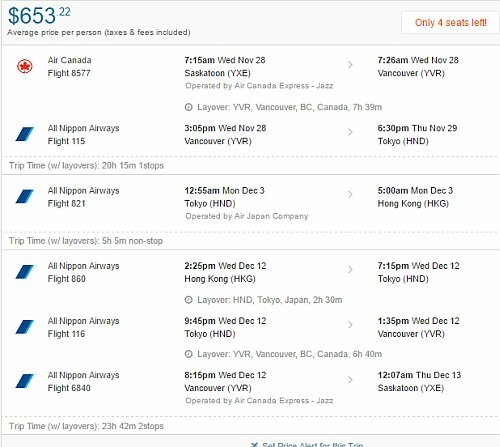 1-stop flights from Saskatoon to Tokyo, Japan - $649 CAD roundtrip including taxes | new record! saskatoon, yxe, flight deals, asia, east asia, united airlines, hong kong, hkg, japan, tokyo, nrt, all nippon airways, ana and hnd.